- you will not win your share of this business if your web site is not Mobile Friendly. Do you see how it would be difficult to read and navigate the normal desktop version of the web site on the left side, while it is easy on the mobile friendly version on the right side. On the right side the first easy thing for the visitor to do is “Click to Call”. It is important to a mobile phone user to be able to quickly call you and let you assist them. Also though, you can also see the large navigation buttons for the mobile phone user to easily be able find more information on the mobile optimized web site. Maybe this can help you understand why over 60% of all mobile users quickly leave a non-mobile friendly site in favor of a mobile friendly one. it is extremely important to not ignore this market! Contact us for a quick review and we can make sure your web site is mobile friendly. We are offering a $ 100 discount to the first 10 customers that order a mobile web site! – you will not win your share of this business if your web site is not Mobile Friendly. Contact us and we can make sure your web site is mobile friendly or we will offer to make your web site mobile friendly. 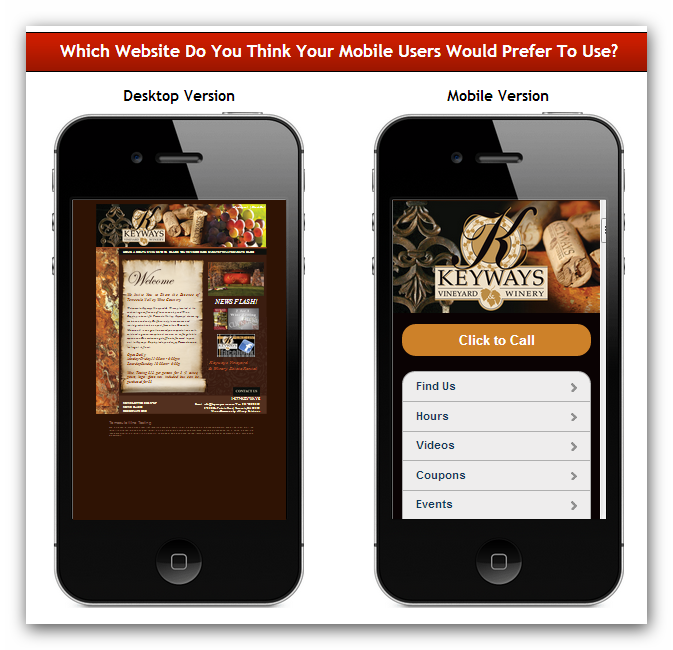 we are offering a $ 100 discount to the first 10 customers that order a mobile web site!